A fruit cart provided three high school students with work experience and underserved neighborhoods with fresh fruit this summer — and the program may be continuing in other Pittsburgh neighborhoods on a more long-term basis. Timothy Lydon, a South Hills native who had lived in other U.S. cities and abroad for several years, returned to Pittsburgh in January with ideas he hoped to import here. One mental image he carried was of a Chicago fruit seller at a train station “in the mixed-income neighborhood I lived in,” Mr. Lydon said. “It wasn’t a farmers market; it was just one guy and a cart.” But the vendor developed relationships with many customers and became a fixture in the neighborhood. 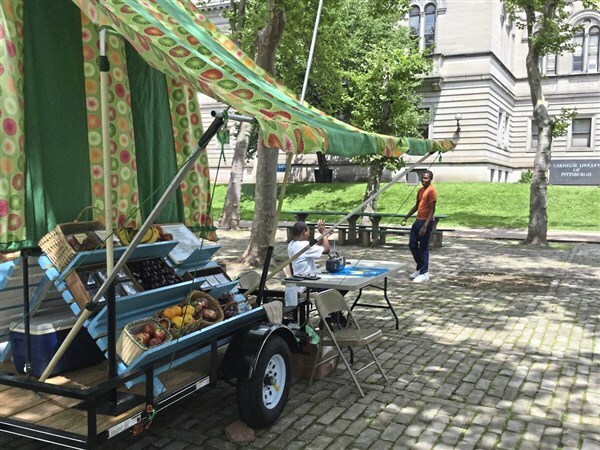 Mr. Lydon, who now lives in Friendship, saw the idea of a fruit cart as a way of bringing healthy food to Pittsburgh neighborhoods that lack grocery stores and fresh-food options. So he started the East End Fruit Cart. But instead of running such a cart himself, he thought it would be even better to let at-risk students run it in order to develop work skills and confidence. He applied for and received a grant from Bridgeway Capital to buy the cart, start a website and print fliers. But in order to accept the grant, he needed a sponsoring organization, and that’s where Bloomfield-Garfield Corporation came in. BGC, a nonprofit that helps to improve the quality of life, helped Mr. Lydon recruit, interview and train high schoolers who needed work experience. Eat ’n Park also provided a small grant. The students completed a training program that helped them learn basic employability skills like how to dress properly, avoid looking at their phones while working and show up on time. Mr. Lydon stayed on site with the cart while the students were working, and he taught them to use iPad technology to ring up fruits. But “I handed them the keys and they took over,” he said. Tamere Lester of Friendship Academy and Ronald Shanks of Brashear High School stayed through the end of the six-week program. A third student, Jamel Haden, worked for part of the summer. The students managed sales, set prices and told Mr. Lydon what inventory he should buy each day. He taught the students how to calculate a 25 to 50 percent markup in order to make a profit. They set up the cart Monday through Saturday, rotating through East Liberty, Oakland, Homewood and Larimer. Mr. Shanks, who hopes to be a lawyer, said the fruit cart helped with social skills. “I was shy before I started, but [Mr. Lydon] opened me up a little bit,” he said. Citing a 2013 Gallup study, Mr. Lydon said racial and ethnic minority students are more entrepreneurially inclined than white students, but their entrepreneurial inclinations tend to decline with age as they meet with barriers to success. He felt it was important to provide an opportunity so that students could hold onto their dreams. The six-week program ended Aug. 5, but Mr. Lydon is in discussions with a West End man with the hope of giving him the cart and helping him start a similar program in West End neighborhoods. Once finalized, the future plans will be announced on eastendfruit.com. ©2019 HELP Initiative Pittsburgh. All Rights Reserved.